Aeoniums can also be used effectively planted in containers and make good house plants as they are easy to care for, grow quickly and will tolerate long periods without water. During the growing season, water the plants approximately once a week or whenever the compost has completely dried out. Water more sparingly in the winter as these plants are adapted to dry conditions. Aeonium ‘Zwartkop’ produces the best coloured leaves if exposed to plenty of sunlight. In winter the plant may have greenish leaves but don’t worry it will soon colour up again in the spring!Aeonium ‘Zwartkop’ is a branching shrub that produces magnificent, almost black-purple, succulent leaf rosettes at the ends of its branches. 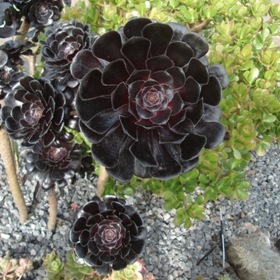 For a dramatic effect the black tree aeonium can be bedded out in summer where its architectural shape contrasts well with most other bedding plants. However, as a native of Madeira, the Canary Islands and North Africa this succulent will need protection during the colder months as the slightest frost will kill it.